I've been wanting to make this mobile for a while and a friends wedding is coming up soon, which means it won't have to live at my mobile-saturated house anymore. The construction was pretty simple if a little time consuming. The main difficulty lay in balancing the thing after due to limited branch options. It turned out well, but is balanced quite precariously. I debated putting leaves on it but after trying them out decided against it. 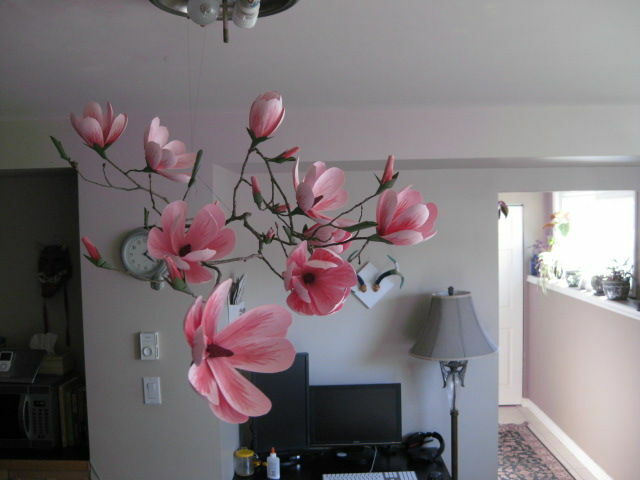 While researching construction methods, I found many examples of paper magnolias made from crepe paper. They all looked great but lacked the fleshy petals I associate with magnolias. I wanted something that gave the appearance of more volume. To this end, I settled on pressing wet card stock to create a concave petal. The whole thing took ~30 hours and cost ~$6.00 for the paper. I only spent one walk looking for the right branch, considering how integral it is, next time I'd spend a bit more time trying to find the right one. This mobile requires a lot of finicky gluing. If you have more money than time, you could use a cyanoacrylate glue to make your life easier. A difficulty with white glue is the setting time. It can takes 5-10 minutes to set depending on how thick it is. As a way to address this I use my glue palette to partially set the glue. Glue straight from the bottle is abysmal at holding items together until it is about half-set. To set the glue, put a little pile of it on your palette and spread it thin. Give it time to set completely. When you are ready to do some gluing, spread another little pile on top of your dried glue. This will allow the dried glue to wick moisture from the wet glue and you'll end up with a pile of half set glue. Once your done gluing just spread another blob of glue on your palette and let it dry for next time. I had intended to do this project with a programmable paper cutter (a cricut) but got a bit to impatient waiting for it. This project ended up being pretty scissor intensive, but I like the slow tactile act of cutting paper by hand. I cut out a single bud petal and just held it in front of a petal blank in order to cut the next one. 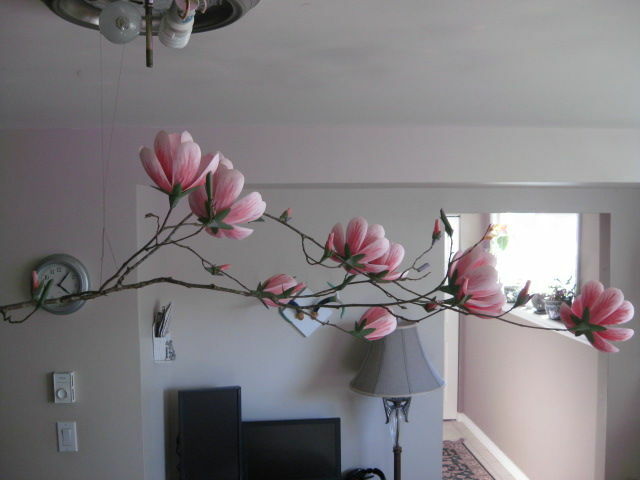 I wanted nine buds total, each one needs three petals, so cut out 27 petals. After I had them all cut out I rolled the petals over a spoon to curve them a bit. Initially I tried this mixing white and red pigment, but just using a little less red pigment and no white pigment was as effective. I used the same little pool of the pigment with varying levels of water content to distinguish the saturation levels. The initial pass was just a light coat of pink. This was followed by some darker brush strokes up from the bottom of the petal. Try to vary the darkness of the strokes a bit. After painting all the bud petals cut out 4 leaves for each bud, I curved them on a spoon as well. Make a shallow little cone out of pink paper, this will go at the tip of the bud to close it up. Glue one petal around the pink cone, once it dries glue the other petals on to it. To close up the bottom of the bud I did a pretty rough job of poking and prodding while coating it in glue. It doesn't matter if it's ugly, it will get covered up. Gluing the leaves to the base of the bud was straightforward. Make a little cut at the base of the leaf, curve the leaf and overlap the paper where the cut is. I like the look of varied leaf lengths, do as you see fit. I put that little green circle at the base of the bud, turns out it was unnecessary because I covered it up with some other green paper before attaching it to the branch. Cut some green paper ribbons and glue them so that they looks like that little cone in pictures one and two. Add some glue! This was the most labour intensive part of the mobile. I made an .svg file to use with a cricut, I ended up manually cutting them out but have included the file in case anyone else can use it. Each flower has nine petals, and I wanted ten flowers. Cut out 90 petals. The hinge piece of this idea was using cardstock to make fleshy looking petals. To this end I wet the petals in a little bowl of water and dried them on a spoon so they would take the form of the spoon. It requires some finicky pressing and pulling of the paper to get it into the spoon without bunching but it you go slowly nice results are achievable. Paint the flower petals using a similar technique to the bud petals. Of note: I initially painted both sides of the petals a similar level of colour, but after looking at some more magnolia petals realized that the inside has much less pigmentation. The second half of the petals were painted to reflect that. To make the stamen I cut out long strips of a deep red cardstock and cut slits just less than halfway all along the length of the strip. Roll the strip on a bias, creating an elongated cone. Glue the whole inside and let it dry (use some masking tape to hold it until then). I cut the bottom off so the stamen wouldn't be too long. The petals were assembled by gluing them in sets of three. Make three of these tri-petal structures, on the innermost of them glue in the stamen and curve the petals how you want them to be. Take the next tri-petal structure and glue it rotated by 60°, do this again with the last tri-petal structure. Cut out some leaves for the flowers, five each. I made these leaves of a standard length because I felt like it. Glue a little pentagon of leaves on the flower. Cut out some more green ribbons, same as from the buds. These little cones will facilitate attachment of the flowers to the branches. Each bud consists of four pieces of green paper, just look at the pictures, they are much more help than anything I'll write here. Make as many as you like, I think I made seven or eight. Use those little green cones and fill them partially with glue, then put them on the end of the branches. Try and spread your flowers out enough to balance the branch. I had to do some pruning of my branch to get my flowers and buds in the places I wanted. My branch was too flimsy but I had trouble finding a more robust one. To fix them I just covered the area in glue and paper, who would ever know? Tie a string around a small rock and cover it all in glue. Because the flowers were poorly distributed on the branch, I mistakenly created a mobile with a center of gravity sitting outside of any of the branches. To mitigate this I had to rig up the string on one of the forks and hang the mobile off-centered on this string. I'm pretty happy with it, but am glad that it has a home to soon. Addendum: I made a box for it but it was ridiculously large so I just wrapped it in a ton of newspaper. Can you please post the measurements for the petals and the greenery. I would love to try to make this beautiful craft. Thank you. Wow, this is gorgeous! I can't believe you hand cut, pressed and painted every petal! Truly amazing. These are lovely. When I first clicked on the image I had a hard time believing they were made of paper! Nice work!! They're pretty good imitations if you don't look to closely. I was hoping for a more flat/stylistic representation, but my watercolouring skills are burgeoning. This is so beautiful and unique. I love magnolia trees. I will make one, but in cream with dark green backed by russet leaves. I bet it was a hit at the wedding. Good for you , making a gift from the heart. It is something they will treasure and remember long after those three toasters have burnt out. Cream with some greenery was my original idea for the mobile, but after seeing some magnolias around town I wanted to try for a pale pink ombré. The flowers turned out a lot darker than anticipated. Thanks Creativeman :) I use masking tape pretty regularly to hold pieces in place for drying. I've avoided using hot glue because I like the long slow process of gluing and holding one piece at a time. Time effective:no, enjoyable: yes.